There is a lack of information about a mixed type of amiodarone-induced thyrotoxicosis (AIT) after heart transplantation (HTx) with no amiodarone treatment in almost 1 year. Frequent ventricular extrasystoles (VES) associated with a mixed type of AIT can often be treated using thiamazole and prednisolone, without the need for specific antiarrhythmic treatment. 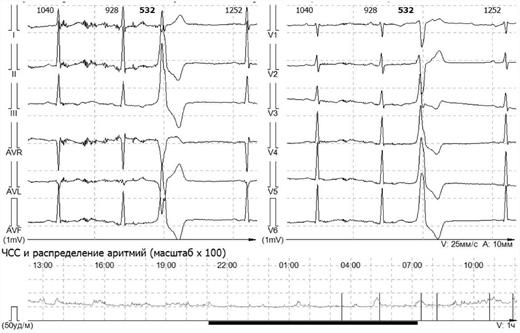 European Heart Journal - Case Reports, ytz030 presents a clinical case of a 65-year-old heart transplanted male patient with frequent VES associated with mixed type of AIT. Recipient had managed with amiodarone prior to HTx but there were no indications for it after the surgery. One year after antiarrhythmic treatment was discontinued, monomorphic VES (total amount: 27 472/day) were diagnosed. The investigation revealed that thyrotoxicosis developed. Prednisolone and thiamazole were added to the treatment with positive outcomes. The antithyroid treatment had been discontinued after 9 months and results of the 24-h Holter electrocardiogram monitoring showed only two VES/24 h.
The case highlights the association of amiodarone, thyroid disorders, and VES. In mixed type AIT or if diagnosis is uncertain, it is reasonable to use mixed therapy. Next is to decide whether you need special treatment for VES. There was no evidence of ventricular tachycardia. Thyroid function tests remained normal off antithyroid medications and the total amount of VES significantly decreased. 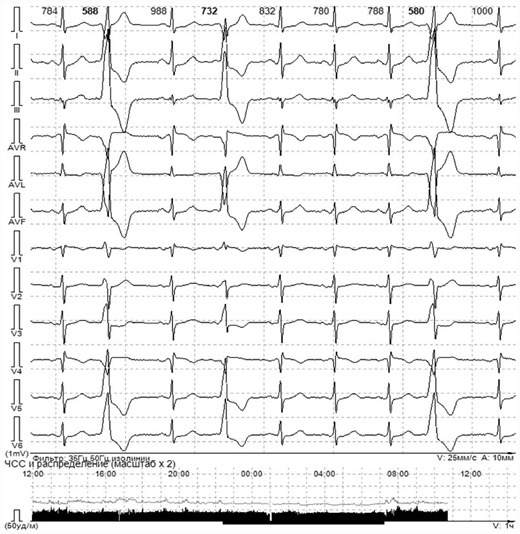 There were no indications for any antiarrhythmic treatment or ablation.